Isagenix e+ Energy Shot | Your search for a healthy energy boost is over! Your search for a healthy energy boost is over! Whether you are a competitive athlete or just an average Jane or Joe, Isagenix’s e+ Shots are naturally caffeinated and nutrient loaded to provide energy for everyone that needs a little pick-me-up to get through the day. With the scientifically proven, proprietary blend of adaptogenic botanicals known to boost stamina, mental alertness, and energy in a healthy, safe way along with the mix of yerba mate and green tea derived caffeine, you will become more alert and active and stay that way. Whether you are squeezing in a workout or just want to get through a long list of daily tasks, you’ve probably found yourself lacking in energy at some point. Most other energy drinks will give you a boost for a short time, but they’re loaded with artificial ingredients, sugar, excessive amounts of synthetic caffeine, and calories that end up making you crash and feel worse in the long run. With Isagenix e+ Shots, you get healthy energy without the crash. With less than 35 calories per serving, you get the mental clarity and energy you need from healthy botanicals and natural sources of caffeine derived from green tea and yerba mate. Try Isagenix e+ Shots and say yes to healthy energy that gets you through the day and say no to jitters and crushing fatigue. You’re not likely to use something that is inconvenient. Fortunately, it’s easy to energize your mind and body with the pocket-sized e+ Shots in their 60ml bottles. Whether you are competing in a sporting event or you’re trying to finish up a project on a tight deadline, bring along a bottle to protect against physical and mental stress and to fight fatigue. With no unwanted side effects, feel energized, refreshed, and ready to perform everything from athletic training to daily activities. 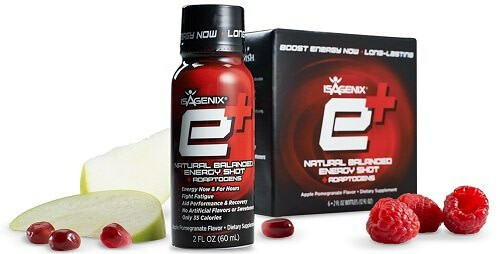 There may be beneficial effects to endurance and stamina thanks to the proprietary mix of botanicals used in e+ Shots. Some products users have reported experiencing improved endurance, improved cardiovascular function, better exercise performance, and increased energy. e+Shots only feature healthy ingredients without any potentially harmful artificial flavours, sweeteners, or colours that are commonly found in other energy drinks. When is the best time to take e+? You can take e+ for an almost immediate increase in energy whenever you are feeling a bit sluggish. Use it during the usual midday crash, try it before you exercise, or take it in the morning to start the day off right. When you’re traveling, it’s also great to take because it offers the extra energy you need to take part in physical activities, get from place to place, or to explore sights. For years, adaptogens have been studied in athletes. By improving cardiovascular function and reducing the perception of effort, they’ve been shown to support higher performance levels and greater energy production. They’re a natural source of nutrition that delivers powerful nutrients to the brain and body and supplies a safe boost in energy. Order e+ shots today if you’re ready for a healthy energy boost that can assist you in accomplishing your goals!